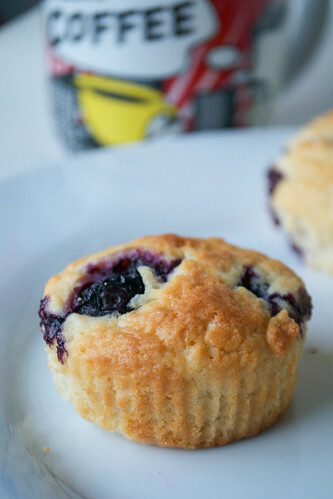 These blueberry muffins are lower in fat than many regular recipes because they contain a naturally fat-free cream cheese. Chuck in a handful of blueberries and you're set for a great start to the day. You'd think it would be easy to make a blueberry muffin. But it isn't. There are so many variations on recipes out there. For example. Do you use sour cream? Oil? Butter? Yoghurt? Cream? It seems that with a blueberry muffin, it's not enough to just knock up a regular muffin mix and tumble in some blueberries. You need some creaminess there - as I found when I tried making them with Quark. Quark is a low-fat cream cheese that looks a bit like thick yoghurt in the tub - it's spreadable and you can bake with it too. And so, because the Quark was so innocent (the label stated it was 'naturally fat-free'), I decided to stick with the butter (but less of it than usual). And after I made the first batch I missed something - a rich, smoky-syrup kick - so I swirled in some maple syrup. They didn't last long in our house. Melt the butter in a small pan (or do it gently in the microwave) and set to one side. In a mixing bowl, combine the flour, baking powder, sugar and the pinch of salt. In a jug, combine the cream cheese, egg and the melted butter. Pour the wet ingredients into the dry and mix together until just mixed - don't over-mix or your muffins will be tough. Fold in the blueberries, reserving a handful. Spoon the batter into cupcake cases in a muffin tray and using the blueberries you reserved, dot a few over the top - I always find some muffins more sparsely blueberried than others and this helps even it out. Bake in a preheated oven for 15-20 minutes at gas mark 6/200ºC. Once slightly golden and firm, cool on a wire rack. Gorgeous enjoyed while just still warm. oooh, creamcheese muffins, what a great idea... i'll take two please... no three... oh go on, four!